The Greenworks 24V Blower is a lightweight, robust blower designed especially for user efficiency and ease of use. 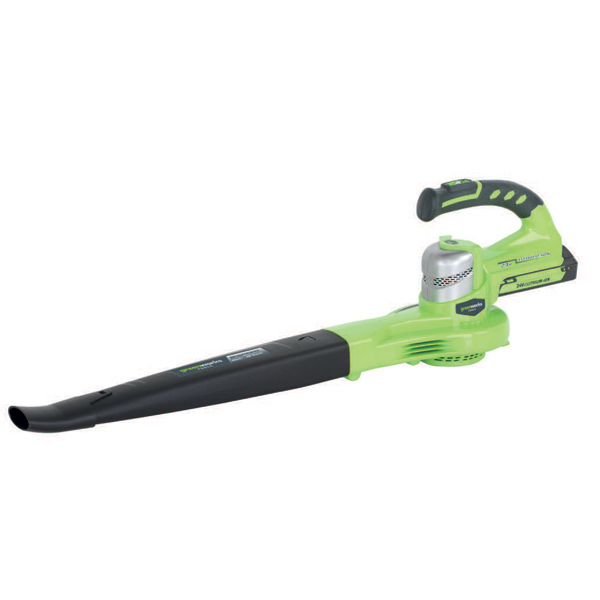 With up to 25 minutes run-time, a 2-speed feature allowing you to choose between 90mph or 130mph and a low maintenence design that doesn't require you to mix oil and petrol, the Green Works Blower makes clearing your garden of leaves and debris quick and easy. The blower has attachments which allow you to focus the force where you need it. The innovative Greenworks Lithium-ion battery offers higher efficiency and enhanced fade free performance. The same 24V battery can be used in any 24V Greenworks tool giving you the total solution to Gas free garden care. Gas free is quieter and all Greenworks products have zero carbon emissions for guilt-free gardening!